I have sim card but i forgot my mobile number…..
How to get mobile number from sim….. These are the words commonly we heard from our friends, in our daily life. 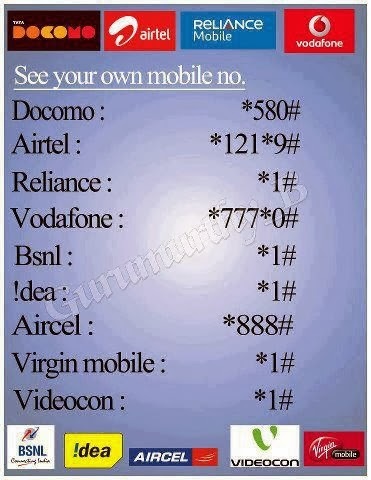 For those who are struggling with this type of words, here is the trick to find the mobile number of any sim. This is not exactly a trick, just a process of changing your mobile number to Tata Docomo (don’t worry your mobile operator is not going to change). But during the process, you will be able to know your mobile number. You can use this trick to know your Mobile Number as well as the Number of any Sim Card. So lets have a look. How To Block Ur Enemy's SIM In 01 Minute? It is successfully tested in following operators: Airtel, Tata Docomo, BSNL, UNINOR, RELIANCE, AIRCEL, VODAFONE Etc. Then note down your mobile number 91XXXXXXXXXX format. UPDATE: One of my friend GOUTHAM gave wonderful solution to the above problem. It is very simple. From your mobile, just dial *1# or *#1# and your number will be displayed on your mobile. It is working for almost all networks and no need of any balance. Even your balance is zero it will work. "please check the phone number you have dialed." What is your operator? Try this, dial *1# or *#1# and your number will be displayed on your mobile. 1800-2660000 is only for DOCOMO. just try this guyzzzz it really workss!!!! For Airtel -*333# working fine even we are in roaming. sab bakwas hai band karo phaltu trick or tips time pass kar rahe hai. my nokia 5233 model and reliance gsm i was write *1# or *#1# is ok working but other nokia model and service provider dial same word but not working. pls suggest me how to ????? does anybody knws how to check uninor number?? i m loss nokia mobile any where so plz help me. Airtel- *140*1600# call And Wait for a mint. TO GET UR IDEA NO. when we have the number can we find out the name of the owner. Results can also include inaccuracies due to the amount of people that have ported or transferred their house phone numbers over to a cellular phone. 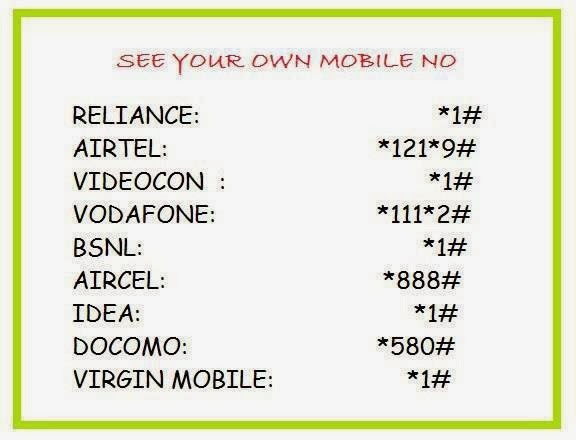 *1# also works on bsnl and some other..
what about reliance c.d.m.a ? wht abut the bsnl rajasthan? This is the third time I've been to your site. Thanks for explaining more details. reliance cdma ka kaise pta kare sir..?? its working I have tested. for BSNL ? any one knows? for reliance cdma this *1# is not working every time they are telling to check the no. can anyone guide me about reliance cdma?????? please tell me how to know bsnl no. from sim. actually i forgot my mob. no. Any hv any new trick??? On international Roaming with an Indian Airtel no. Nothing works. Pls help. its not working for aircel too.. Dial *580# for tata docomo. Thanks a lot dude...it helped me alot. what about bsnl in Rajasthan. kise k pass kuch achche trick ho to mere no pe sms kar dena. For BSNL *1# or *#1# or *2# nothing is working??? *121*9# is working on airtel punjab. tmobile in the uk anyone? Thank you very much. This has saved me a lot of time and spared me of trouble. vodafone - *111*2# is giving me only the tariff plan and not the number?? i have a bsnl sim gujarat and i forgot my no. i hav no balance in my sim. pls help me to find my number.. Please tell me the rigth answer ! How to check the IDEA NetSetter Mobile Number if there is no balance?? how to check mtnl (Dolphine) sim no. Nice article. thanks for share with this information about US. GREAT JOB. THANK U VRYRY.. Thanks for this post. For BSNL Tamilnadu *888# works.